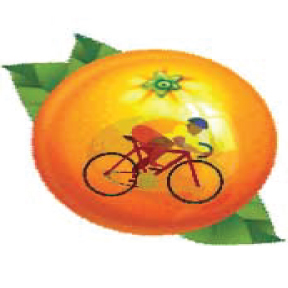 Cycle 30, 62.5, 79 or 101 miles through the rolling hills of Orange, Chatham, and Alamance Counties. Benefits the National MS Society of the Greater Carolinas and a heart transplant fund for Glen Newhart of Durham thru the National Foundation for Transplants. (www.transplants.org). Get ready to ride the MS Ride in New Bern! 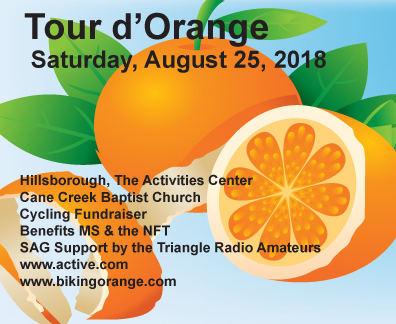 Great SAG support provided by the Triangle Radio Amateurs, marked roads, rest stops with plenty of fresh fruit like watermelon and pineapple and peanut butter & jam sandwiches made with 14 loaves of bread from Weaver Street Market. All routes start at 8 am and end at 5:00 pm from Buckhorn Rd. 20 mph plus, 17-20 mph, 15-17 mph and the rest. There is a good hill in that last loop of the century, plus pretty farm country. Sorry folks Air Conditioning is out at the Center. I just got notified last Thursday. We will have registration outside. No Bike Shoes in the building. NO CLEATS IN the Building. Fire Departments are quite concerned; we have to get off the Road if a fire truck comes from behind. There is simply not enough clearance for them to pass a rider on the road. Sometimes there are two trucks! Always get off the road for even one fire truck or ambulance. Fire trucks video tape all calls! Do not be a fatality! If one approaches, please get off the road as well. Your safety is primary! We will have an Orange County Sheriff's Dept. car following the ride in Orange County. That way cars coming from behind will be aware that there is reason to slow down. Donate $50 or more directly to the Glen Newhart Transplant Fund (http://transplants.org/ go to donate and find patient) and ride for free plus it is a tax deductible contribution to a 501(c)3; will need to see proof/paper receipt at registration or email me. He had rheumatic fever as a child and will need $33,000 to be eligible. His family will appreciate it! He has a daughter who is in college. Dunkin Donuts muffins at the start, Radius Pizzeria & Pubs Pizza and Mediterrranean Deli Salads after the Ride as well as Maple View Farms ice cream! Bandido's (Hillsborough, Carrboro, Chapel Hill, & Durham) Burritos will be available around noon. One of my favorites! Mediterranean Deli is on Franklin Street in downtown Chapel Hill. Love all of their food! $25 thru August 22, $35 August 23 thru 8/24. $45 day of. No transfer fee. 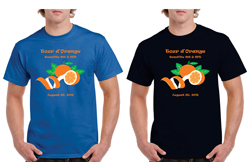 Buy a T-shirt for $5 up to XL or $7 for XXL if you sign up by August 9. If you buy a shirt be careful to choose either Royal Blue or Black. (written next to the sizes). The Activities Center is approximately 8 miles from I-40. Take Exit 261 in the direction away from Hillsborough on Old Highway 86 ( if you go by McDonalds on your left turn around). Go 0.5 miles on Old Highway 86, turn right on Davis Rd for 3 miles and left on Orange Grove Rd. for 4.3 miles. Left side of the road on a hill. Today, 8/16/18, I just got word that A/C is out in the Activities Center and it cannot be fixed in time, high for 8/25 is 82 F and there will be fans going. So sorry. All routes start at 8 am. Paper registration available through the website. Registration available the day of the event for $45. Sign yourself up on active.com and show confirmation email or bring cash or a check. No card reader on site. Rain or shine. No Refunds. Must wear a helmet to participate. Minors must have an adult ride with them if under 16. All minors must sign a waiver the day of the event. Parents or Guardians must also sign the waiver the day of the event. Wristbands on the left wrist. Bring a cell phone to call in case of a mechanical, got lost or simply want a pick-up. Thank the Triangle Radio Amateurs, they are all Volunteers!